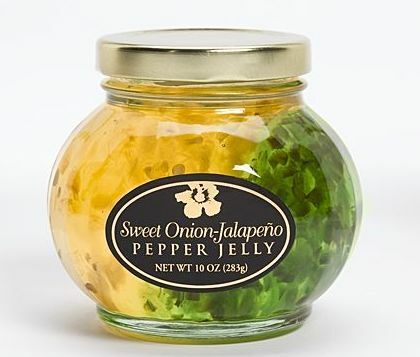 Sweet Onion Jalapeno Pepper Jelly - split with personality, the tangy, sweet flavor with a hint of heat is a delicious glaze for pork or shrimp... spread pepper jelly with cream cheese on bagels or crackers, or make a pepper jelly cheesecake. Aloha from Oregon sweet onion jalapeno pepper jelly: the possibilities are endless! Aloha From Oregon Sweet Onion Jalapeno Pepper Jelly. Serve any of our selected pepper jellies over cream cheese or warm Brie and crackers. Warm any flavor of pepper jelly and use as a taste-tingling dipping sauce for shrimp, chicken wings, strips or tenders. Toss pepper jelly with hot grilled or steamed vegetables and steamed rice for a side dish. Add to stir-fry for a spicy-sweet flair. Mix with softened butter, chill and serve on warm corn bread. Make a spicy peanut butter and pepper jelly sandwich.